Grossman suggests that smaller merchants consider outsourcing the handling of credit cards to a solid and reputable third-party. Sourcebooks’ Raccah said the company is in the process of doing just that. What’s more, as an increasing number of banks begin issuing more secure chip-based cards — and by extension more main street merchants in the United States make the switch to requiring chip cards at checkout counters — fraudsters will begin to focus more of their attention on attacking online stores. The United States is the last of the G20 nations to move to chip cards, and in virtually every country that’s made the transition the fraud on credit cards didn’t go away, it just went somewhere else. And that somewhere else in each case manifested itself as increased attacks against e-commerce merchants. If you haven’t pre-ordered Spam Nation yet, remember that all pre-ordered copies will ship signed by Yours Truly. Also, the first 1,000 customers to order two or more copies of the book (including any combination of digital, audio or print editions) will also get a Krebs On Security-branded ZeusGard. So far, approximately 400 readers have taken us up on this offer! Please make sure that if you do pre-order, that you forward a proof-of-purchase (receipt, screen shot of your Kindle order, etc.) to spamnation@sourcebookspr.com. 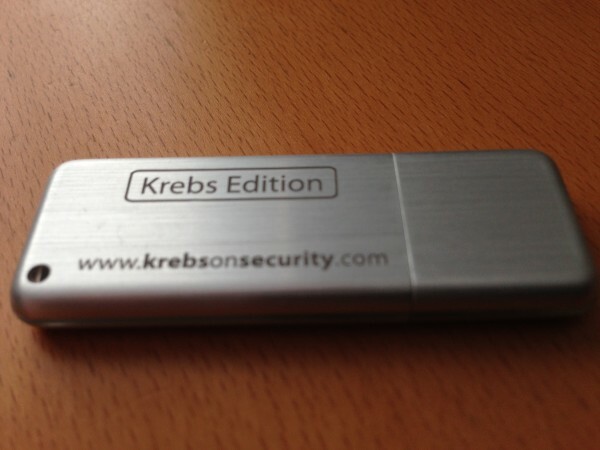 Pre-order two or more copies of Spam Nation and get this “Krebs Edition” branded ZeusGard. This entry was posted on Thursday, October 23rd, 2014 at 12:29 pm	and is filed under Data Breaches, Spam Nation. You can follow any comments to this entry through the RSS 2.0 feed. Both comments and pings are currently closed. I thought the PCI-DSS specifically disallowed the storing of the CVV2 data specifically for this purpose. The CVV2 is NOT to be stored, so that when a breach happens, the malactors do not have the CVV2, and cannot perform new online transactions where a CVV2 is required. The entire point was to enhance the security of online transactions, and prevent these types of database breaches from causing so much harm. Wow 4 9’s, so who was the unlucky purchaser? I did have to go and check to see that I had used Amazon, 4 9’s leaves some room. But also amusing, Thanks for the heads up. This can’t possibly be a coincidence. Alanis Morrisette, are you paying attention? Brian, just wondering if you were notified by the publisher, or by another source? I subscribe to a feed from the California AG’s office. I read about it there. Nice job staying ahead of this before someone else took advantage of the association. Or it could just be simple math, as in a percentage. Brian, do you have any reason to believe (however unfortunate) that the target on your back drove the perpetrators to Sourcebooks? I would imagine there are a number of publishers out there with vulnerable credit processing systems….why Sourcebooks, and why now? Basically, I’m highlighting the irony you mentioned in the article. Thoughts? FWIW, in the last paragraph of the article, you call your new book “Span Nation”. Both instances of software are excluded from being subject to PA-DSS. The fallback is to revert to PCI DSS, but how often does that happen? To Allan Jude’s comment about the CVV2 data, and to Jeremiah’s point, this is hard stuff to do for smaller retailers. They are almost always better off using another web service (such as paypal) to handle the credit card processing. Small shops trying to do it all on their own will always struggle, and as a shopper I want to support small shops, but also limit those that are trying to do everything themselves. Even for medium-sized businesses, this makes a lot of sense. Working at a regional electric utility we pushed to have a hosted payment system for both our Web and IVR systems. It actually cost us nothing more, and we have nothing to do with PCI-DSS except to train our CSRs never to touch a customer credit card (which includes assisting old people with trying to dial our IVR payment system). No, we don’t accept CCs via over the counter – we direct customers to pay either online or via IVR (phone). We only take cash or check over the counter. One of our unstated goals is to never make it in the paper, and as far as CC fraud goes, we never will because we never accept or touch CCs. Your company IS still responsible for PCI DSS. Based on what you are stating, you should be filling out an SAQ-A. Now, your involvement is minimal, but you should be validating that the third party(ies) that are providing your web payment and IVR payment systems are themselves PCI compliant (they are Service Providers). There is actually a provision within SAQ-A that allows for some paper copies of card data to exist (invoices, hand receipts, notes, etc.) but mostly you are validating on an annual basis that you don’t touch any electronic form of payment card data. It’s great when you can outsource – but then Jimmy John’s thought the same thing…and look what happened to them. What shopping cart software were they using? just from looking at their checkout page it seem to be cs-cart. sven wrote Sourcebooks is using cs-cart software. a) How many sites use that software? b) How many of them have the same vulnerability? c) How many of the vulnerable sites have been compromised? The reason for processing web orders in house is the same for many decisions … money. The cost savings for doing it yourself is compared to outsourcing. Missing from this analysis is the expected cost for a breach where EV=p(e) x v(e) where p(e) is the probability of the event and v(e) is the value of the event. The product is the “expected value” of the event. If you don’t do it yourself the probability of you being breached and exposing consumer financial information is zero. The probability of your contractor being breached is another question, so make sure they (not you) are contractually responsible for those costs. If a company does do it themselves the value (expressed as a negative number or a cost) of a breach is high, and we hope the probability of a breach is low. Small companies generally can’t afford large I/T budgets which, as we’ve seen all too frequently, are no guarantees of security. Add the EV(breach) to each cost and the cost of outsourcing might be more attractive. I note that you haven’t mentioned Google Books (Google Play Store) in your list of retailers now or previously, and I did order through that venue for my own convenience. More”bad” news to come i think .How about hacking a printing shop it was printed at and change couple of pages to something “Fresh and interesting ” ??? You need to bring your book tour to sunny Daytona Beach Florida. I need to pre-ordered that book. Iroic, yes, but the timing and targeting seem unlikely to be mere coincidence. It will be interesting to see what (if anything) the forensics team can learn about the perpetrators of the breach. Hopefully you’ll be able to get some inside information instead of the usual close-lipped law enforcement silence. Unencrypted credit card numbers? Storing CVV2? What’s next for Sourcebooks? Lawsuits? Heavy fines or higher fees? That’s gonna hurt. Really looking forward to this book. Difficult to find good books on Cybercrime. Kingpin, Takedown, and the Cuckoo’s Egg are my favorites. and my ‘real’ static payment-card number. Apple Pay & Google Wallet are the physical versions of tokenization technologies that have existed for years. How ironic…this is quite the headline! Luckily for most buyers, Sourcefire was not where purchases were made. How can emails stored on some third party servers be secure? Binfer bypasses email storage servers. This is the best way to send secure email. The link is http://www.binfer.com. Man, who handles their own payments anymore? I can’t imagine not outsourcing to a dedicated substantial, well-regarded payment company, which implies security measures. It is still possible to pay with your Mastercard with no signature NeXT to the magnetic stripe and later find out, that your Mastercard payment ended up as an illegally activated account with Paypal – and you find out that EU Law dictates the Paypal “Man-in-the middle” to be registered as a bank in Luxenburg. So – consequently – your data and transactions are suddenly stored in a different server – than the one “safeguarded” by your own bank. I live in a ham nation but look forward to read about the Spam nation. Poor Brian, your fans still love you. What a bunch of losers, the thieves not the publisher! Don’t feel bad. A soldier on the front lines of a war is bound to get hit with something sometime. Could have been worse. Maybe you can use it in your next book. You’re still the best source of super information out there on cybercrime. We who depend on you, salute you, and we’ll just send a 3rd-finger salute to the guys who breached your publisher. !! Although I pre-ordered the book through Amazon, I also signed up for the autograph plate. I cannot remember with whom I signed up for the autograph plate but am wondering if any PII is at risk due to this breach and it’s impacting the autograph plate requests? Thanks! if the merchants are NOT in compliance with readers and new card technology….they will pay for the fraud. funny part is visa and mc are moving away from paying for fraud through compliance….read those NEW card agreements closely. sorry that post was for the article..
Admin33 – regardless of whose pocket comes the money, in the end we consumers pay the bills. Some merchants have small profit margins and passing that expense on to consumers could drive them away. This is one of the reasons for the creation of MCX. Instead of making fancier and more expensive locks we need a change in approach to denying crooks their prize by keeping the confidential consumer credentials out of transactions transmissions to providers. What merchants don’t have crooks can’t steal. As of 9 a.m. today, Nov. 18th, Powell’s Books in Portland was sold out of “Spam Nation”. Advised them to order more ASAP.